Emily Short, 4, Burlingame, speaks with SFC Jeff Troth, 1st Infantry Division, at Friday’s presentation. Emily wore a shirt with a photo of her sister, Brittany Moore, and button with photo of her brother, Cody Moore, both of whom currently serve in the armed forces. 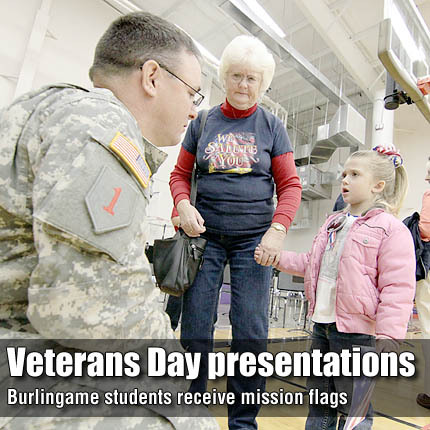 On Veterans Day, seven Burlingame Elementary School classes each received a United States flag, which had been flown on a Dec. 28, 2010, helicopter combat mission in Iraq. In observance of Veterans Day 2010, elementary school students wrote letters of thanks to soldiers on duty in Iraq. Teachers and classes that participated in the letter-writing effort included: Trish Paree, kindergarten; Jill Laws, kindergarten; Chelsi Gardner, first grade; Kandi Lee, second grade; Kim Peterson, second grade; Amy Heckman, third grade; and, Amy Westeman, fourth grade. Adam Hunt, then future son-in-law of Paree, served as the link between the students, their letters and the flags. Hunt, a helicopter pilot, was deployed with Alpha Company Devils, 1st Attack Reconnaissance Battalion, of the 1st Combat Aviation Brigade, 1st Infantry Division, based at Fort Riley. Hunt is now a medevac pilot in Farmington, Mo. Berryhill, a former Topeka resident, is operations officer of the 1st Attack Reconnaissance Battalion. He served tours of duty in Iraq in 2003, 2005 and 2010. Evan Young, Caitlynn Burns, Kelsie Quaney and Dalton Sporing. Except for the presentation by Berryhill and Burlingame Elementary Principal Tamara Buche serving as master of ceremonies, students performed the ceremony, which opened with Burlingame Cub Scout Pack III, under leadership of Stacie Thomas, forming the color guard. Fourth-grade student Zachary Fitzgerald led the Pledge of Allegiance. My Country ‘Tis of Thee was sung by the kindergarten to fourth-grade choir, directed by Skyler Brussee. The Treble Cats, also directed by Brussee, sang God Bless America. A medley of service songs of the armed forces was performed by the Burlingame High School band, directed by Mark Hecht. Under direction of Linda White, the BHS show choir sang My Country ‘Tis of Thee. To honor soldiers who had fallen while serving their country, trumpeter Chris Mohn presented Silver Taps. Closing the ceremony, the colors were retired by the color guard. A patriotic display of American flags along the entrance was presented by members of American Legion Riders Post 421. When the flags arrived at the school in March, Buche and teachers decided to keep them a secret. Buche began making plans to feature presentation of the flags and certificates during a ceremony on Veterans Day. As the day drew nearer, Brussee and Hecht assisted with final arrangements. In addition to students, the bleachers were filled with members of the Burlingame community. Many veterans stood while their respective service songs were played by the BHS band.